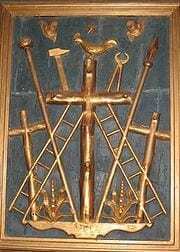 The Instruments of the Passion used during the Crucifixion (the Sponge, the Spear (the Spear of Destiny), the Nails, the Cup (the Grail) etc. There is a common belief that they have some supreme power. Nazi tried to find and possess them.